"Half twain! Quarter twain! M-a-r-k twain!" 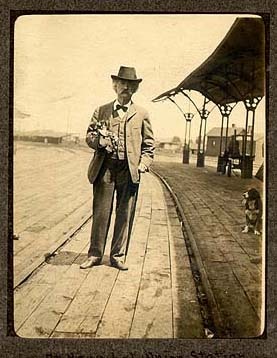 For most people, the name "Mark Twain" is virtually synonymous with the life along the Mississippi River immortalized in the author's writing. Clemens first signed his writing with the name in February 1863, as a newspaper reporter in Nevada. "Mark Twain" (meaning "Mark number two") was a Mississippi River term: the second mark on the line that measured depth signified two fathoms, or twelve feetsafe depth for the steamboat. In 1857, at the age of twenty-one, he became a "cub" steamboat pilot. The Civil War ended that career four years later by halting all river traffic. Although Clemens never again lived in the Mississippi valley, he returned to the river in his writing throughout his life. 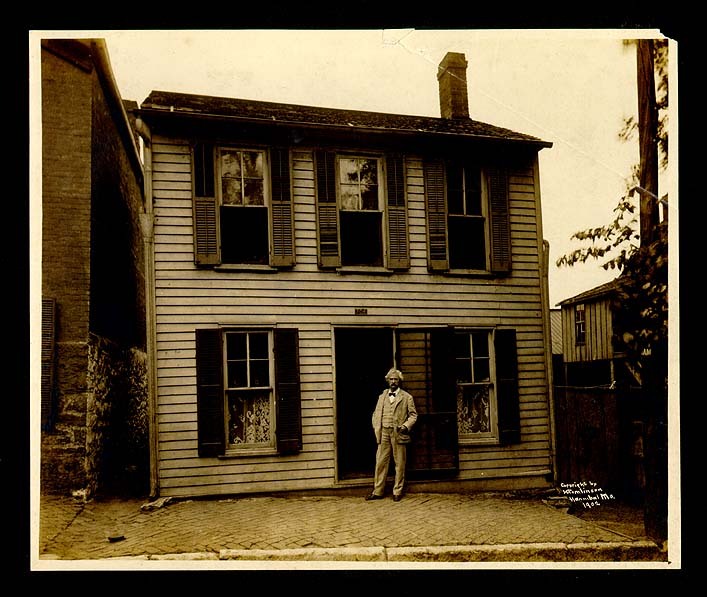 And he visited a number of times, most notably in 1882 as he prepared to write Life on the Mississippi, his fullest and most autobiographical account of the region and its inhabitants, and again in 1902 when he made his final visit to the scenes of his childhood. "My boy, you must get a little memorandum-book, and every time I tell you a thing, put it down right away. There's only one way to be a pilot, and that is to get this entire river by heart. You have to know it just like A B C." Clemens received this advice from Horace Bixby, the river pilot who "learned" him the river. 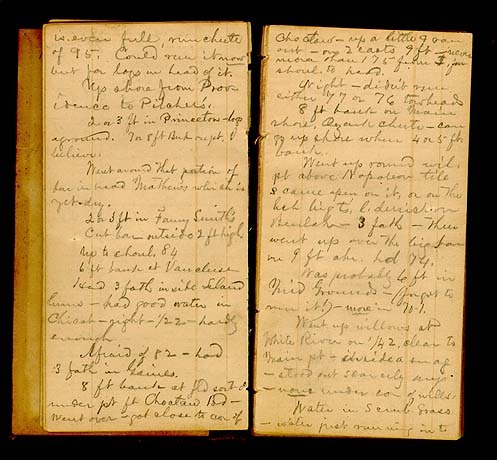 Ruled for use as a ledger, this notebook also contains the cargo records of a steamboat clerk, suggesting that Clemens probably acquired it in some haste from that clerk. The dense texture of navigational directions on the pages displayed includes the young pilot's notes in the area of St. Louis. 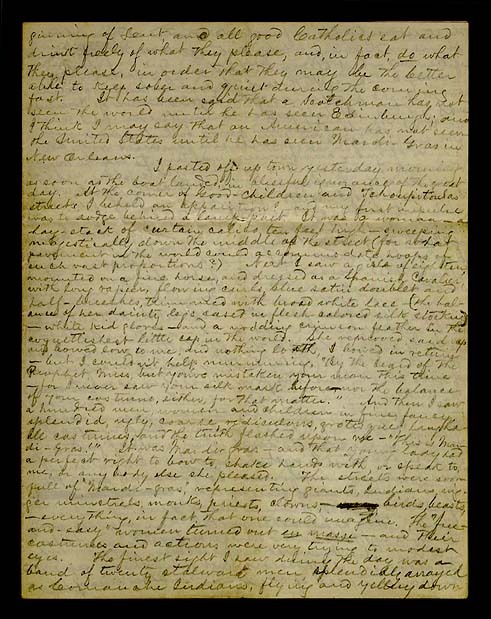 "Lost and ruined sinner as I am"
Five days before Clemens wrote this letter to the wife of his brother Orion, his younger brother Henry was severely injured in an explosion on the steamboat Pennsylvania. 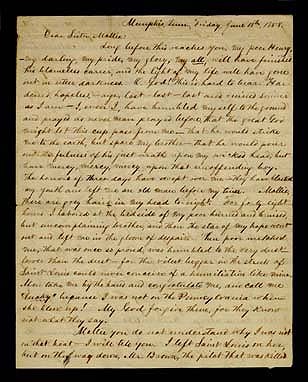 Clemens himself would have been piloting the Pennsylvania except for circumstances he explains in the letter. He was reunited with Henry in Memphis two days after the explosion and nursed him for six days. Henry died on 21 June, one of some hundred who died from the explosion.
. . . lost and ruined sinner as I amI, even I, have humbled myself to the ground and prayed as never man prayed before, that the great God might let this cup pass from me,that he would strike me to the earth, but spare my brotherthat he would pour out the fulness of his just wrath upon my wicked head, but have mercy, mercy, mercy upon that unoffending boy. The horrors of three days have swept over methey have blasted my youth and left me an old man before my time. Mollie, there are grey hairs in my head to-night. For forty-eight hours I labored at the bedside of my poor burned and bruised, but uncomplaining brother, and then the star of my hope went out and left me in the gloom of despair. Then poor wretched me, that was once so proud, was humbled to the very dust,lower than the dustfor the vilest beggar in the streets of Saint Louis could never conceive of a humiliation like mine. Men take me by the hand and congratulate me, and call me "lucky" because I was not on the Pennsylvania when she blew up! My God forgive them, for they know not what they say. As a Mississippi River pilot Clemens came to know New Orleans well. 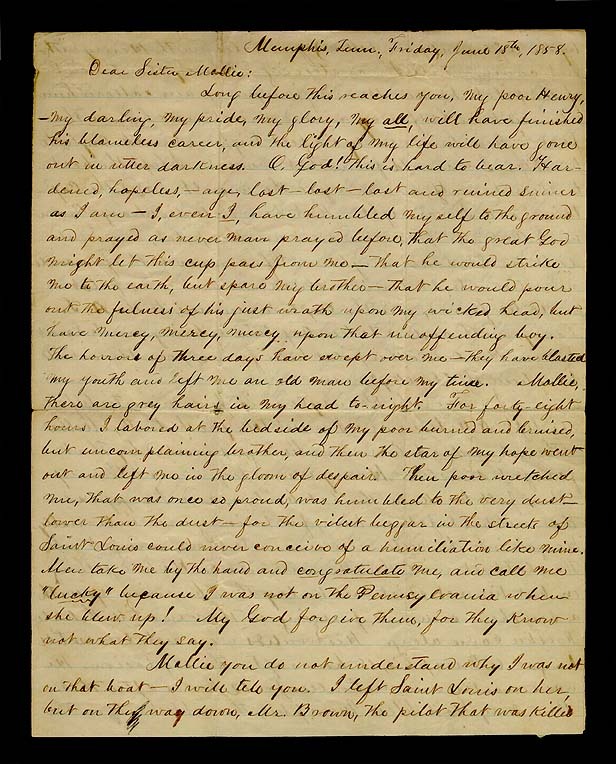 In this densely inscribed letter to his sister, Pamela A. Moffett, the twenty-three-year-old describes Mardi Gras. "I think that I may say that an American has not seen the United States until he has seen Mardi-Gras in New Orleans." At the corner of Good-Children and Tchoupitoulas streets, I beheld an apparition!and my first impulse was to dodge behind a lamp-post. 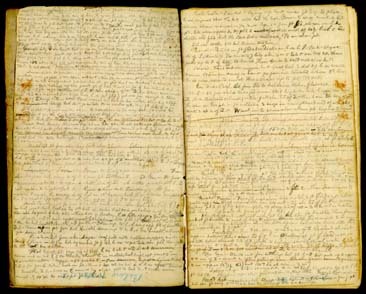 It was a womana hay-stack of curtain calico, ten feet highsweeping majestically down the middle of the street . . . . Next I saw a girl of eighteen, mounted on a fine horse, and dressed as a Spanish Cavalier, with long rapier, flowing curls, blue satin doublet and half-breeches, trimmed with broad white lace(the balance of her dainty legs cased in flesh-colored silk stockings)white kid glovesand a nodding crimson feather in the coquettishest little cap in the world. She removed said cap and bowed low to me, and nothing loath, I bowed in returnbut I could n't help murmuring, "By the beard of the Prophet, Miss, but you've mistaken your man this timefor I never saw your silk mask beforenor the balance of your costume, either, for that matter." And then I saw a hundred men, women and children in fine, fancy, splendid, ugly, coarse, ridiculous, grotesque, laughable costumes, and the truth flashed upon me"This is Mardi-Gras!" "In due course I got my license. I was a pilot now, full fledged," Clemens wrote in Life on the Mississippi. He acquired his pilot's certificate on 9 April 1859, after two years of apprenticeship. 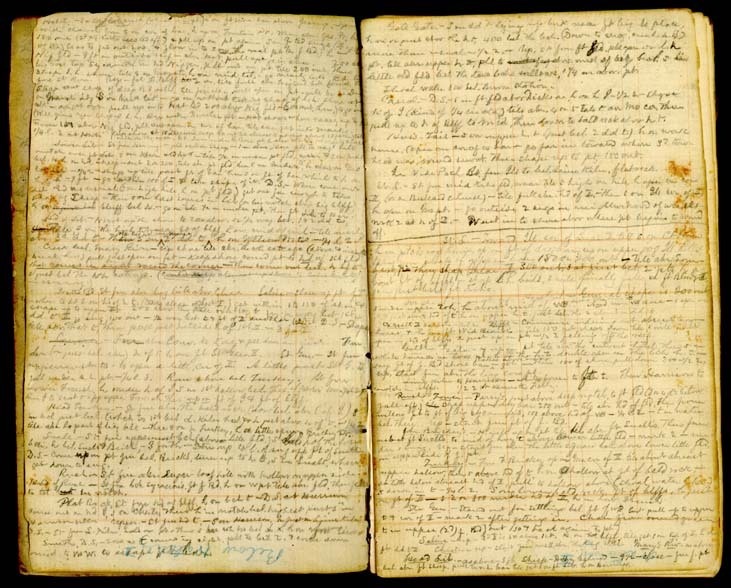 This notebook, which he used from November 1860 until March 1861, is the only one known to survive from his two years as a licensed pilot, and is probably the last that he kept on the river. 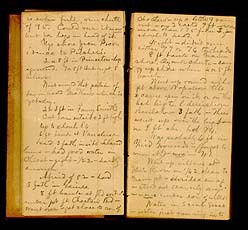 Clemens made these notes while piloting the steamboat Alonzo Child upriver from New Orleans in January 1861. If I have seemed to love my subject, it is no surprising thing, for I loved the profession far better than any I have followed since, and I took a measureless pride in it. The reason is plain: a pilot, in those days, was the only unfettered and entirely independent human being that lived in the earth. For four months in the winter of 1884-1885, Clemens joined the southern writer George Washington Cable in a lecture tour. The two authors delivered readings from their works in over sixty cities across the United States and Canada, including Clemens's hometown. 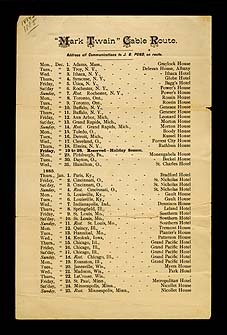 Clemens's programs included selections from Huckleberry Finn, which was published shortly before the tour ended. His notes show him timing the readings (he was particularly sensitive about Cable's taking more than his share of the time) and scribbling ideas for program changes. "Such slathers of ancient friends"
On their 1884-1885 lecture tour, Clemens and Cable read both in Hannibal and in Keokuk, Iowa, where Clemens visited friends and family. Such slathers of ancient friends, & such worlds of talk, & such deep enjoyment of it! . . . A beautiful evening with ma& she is her old beautiful self; a nature of pure goldone of the purest & finest & highest this land has produced. The unconsciously pathetic is her talent& how richly she is endowed with it& how naturally eloquent she is when it is to the fore! What books she could have written!& now the world has lost them. This visit to Hannibalyou can never imagine the infinite great deeps of pathos that have rolled their tides over me. I shall never see another such day. I have carried my heart in my mouth for twenty-four hours. 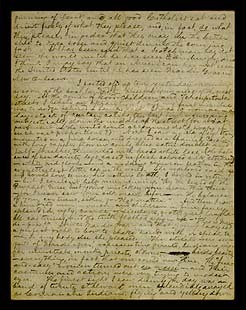 And at the last moment came Tom Nashcradle-mate, baby-mate, little-boymatedeaf & dumb, now, for near 40 years, & nobody suspecting the deep & fine nature hidden behind his sealed lips& hands me this letter, & wrings my hand, & gives me a devouring look or two, & walks shyly away. 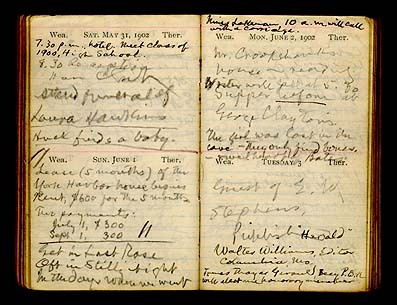 Clemens carried this tiny notebook with him when he traveled to Missouri in May and June 1902 to receive an honorary Doctor of Laws degree from the University of Missouri. Spending a few days in both Hannibal and St. Louis, he made a last visit to the scenes of his childhood and youth, finding occasion for many poignant reunions and for much reminiscing. He distributed the diplomas at the Hannibal High School graduation exercises, met his childhood sweetheart, enjoyed a reunion with fellow river pilots he had not seen in forty years, and briefly steered a steamboat at St. Louis. "It all seems so small to me; . . . a boy's home is a big place to him. I suppose if I should come back again ten years from now it would be the size of a bird-house." As Clemens prepared to leave Hannibal for the last time, Tom Nash, a childhood friendnow deafapproached him. "He was old and white-headed, but the boy of fifteen was still visible in him. He came up to me, made a trumpet of his hands at my ear, nodded his head toward the citizens, and said, confidentiallyin a yell like a fog horn'Same damned fools, Sam.'"